Seriously, how can anyone not love Lush products? After the positive experience with Mask of Magnamity, I walked into Lush again two weeks ago, asking to try out another of their star product. This time, for my hair. I have oily scalp so I was recommended the popular Sea Salt Shampoo. The sales person also recommended me a hydrating conditioner for my hair ends lest the sea salt dries my hair fibres. I will not delve too much into the ingredients. You can refer to the picture in this post for the list. The Sea Salt Shampoo is self-preserving but I realised that it contained SLS. Yup, I have cut out SLS from my shampoos, but since this product is only used once or twice a week, I figured my body chemistry can handle it. 😀 The American Cream, according to the sale person, is a hydrating conditioner that leaves a sweet scent in your hair hours after you’ve used it. Don’t believe? I wet my mid length hair thoroughly (and I mean really wet) before I scoop out, with my 3 fingers, a big dollup of the Sea Salt Shampoo. Okay, here’s the tricky part – its all coarse salt mixed with all other liquid ingredients. Its a dense mix – seriously. So I slap on the mixture onto the crown of my head, and slowly distribute the product to my entire scalp (I tuck them under my hair strands bit by bit). Then I’ll gently massage the product (lightly okay.. just to gently have the product get onto to the scalp) and I noticed that the salt crystals gradually dissolve. I focus more on the areas where my scalp feels oily. After massaging for about 2-3 minutes, I ran my hair under water and gently shake out the salt (beware- your bathroom floor will be covered with salt crystals that has not dissolved, but its fine. Salt is good for rough skin on my feet, I reckon); while combing my fingers through my hair and feeling around my scalp in case any salt crystals choose to stay on my scalp. Once that is done, I will gather my wet strands, and pour a teaspoon of the American Cream and start to coat them on my hair strands. I stay away from the scalp coz I don’t want to clog them. Leave them on for about 30 secs to a minute before I rinse them all out. I didn’t like the American Cream scent when they are on my hair initially, but once I dry my strands (hand dry with a fan, not blown dry), I can smell sweet whiffs coming out from them… OOOOOHHHHH!!! Love them! Best of all, when I wake up the next morning, the scent stayed on and didn’t go away until I start to perspire in the tropical sun. That is A.M.A.Z.I.N.G! The Sea Salt did wonders to enliven my hair. I didn’t get big hair but my hair strands do feel lighter (my scalp too, its like its gone through some detox session). The comb ran through the hair alot easier too! Any Lush outlets or their online stores! I notice that Lush Singapore has an online store too! Will I restock this? Absolutely!! 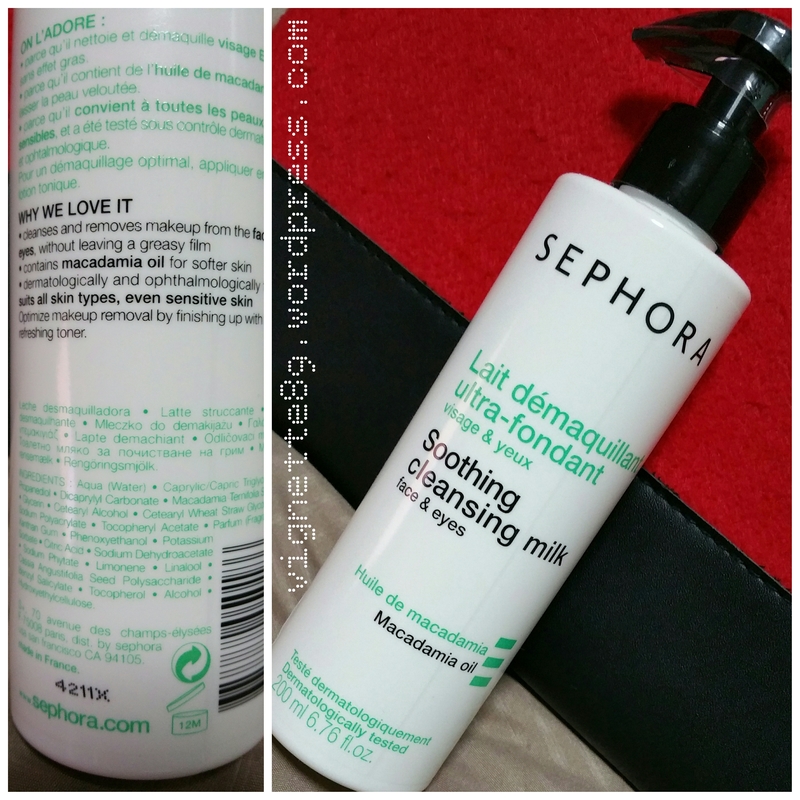 Bought Sephora Soothing Cleansing Milk after using it to clean the testers on my hand in Sephora SG. I must say this is a good product though personally I still prefer to use the Triple Cleansing Water from Sephora. This is a creamy cleansing milk and it does remove makeup on the eye and face very well. It does leave the skin feeling soft without oily feeling. The ingredient list is in the image provided in this post. I would pump out 2-3 pumps of the product onto my hand and spread it onto my face. Thereafter I will massage my skin to help loosen the makeup before I wipe my face with a wash cloth or tissue, followed by rinsing to remove the remnants of the cleansing milk. For precautionary reasons, I further cleanse my skin with my usual facial foam and Clarisonic. In comparison with Micellar Water that I’ve used, I would have preferred Micellar water over cleansing milk because of the texture. Micellar water is a lot lighter and more refreshing. It is true that this product does remove make up very well, including waterproof makeup. However, personal preference is to choose water based cleanser over milk based for sensitive skin. If you ask me if I’ll restock this item – I may but unlikely if I can have Micellar water. 🙂 But I must say that for those who prefer cleansing milk, this is a good product to have! What about you? Do you like cleansing milk? If so, what cleansing milk do you like? I had wanted to set up a blog to share my thoughts about things that interest me – just like anyone else – but I had never went past the point of setting up a blog because I could not find the right word to call it. Today I came across a word – vignette – and I thought – hey I can call mine that! So I did. The rest is history. Here I am. I am not a regular blogger who sits before my laptop all day tapping away while the thoughts flow. I have a day job, and I will need to make adjustments to accommodate this new project of mine. So bear with me if you don’t hear from me as often as everyone else. I’ll be back with more posts about some of the interesting things (well I thought its interesting) that I’ve been expending my energies on.